Page 5 - Finshed Puppy Book1. schedule to match your dog’s lifestyle. three months to keep your pet parasite free. 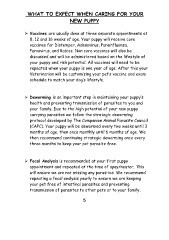 transmission of parasites to other pets or to your family.